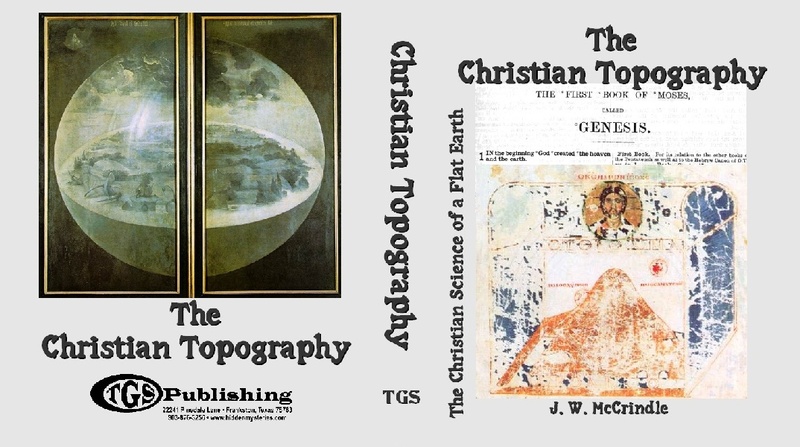 THE Christian Topography of Cosmas Indicopleustes is one of the prodigies of literature. The boldness and perverse ingenuity with which its author, from a long array of irrelevant scripture texts, seeks to construct an impossible theory of the universe can scarcely fail to astonish everyone who reads it. It made its appearance at that period in the world's history, when Christendom, fast losing the light of Greek learning and culture, was soon to be shrouded in the long night of mediaeval ignorance and barbarism. The work reflects with singular distinctness this prominent characteristic of the age which produced it; for while Cosmas, on the one hand, held the principles of the Christian faith combined with others pervading the theology then current which led to the darkening of all true knowledge, he had, on the other hand, a somewhat considerable, if inexact, acquaintance with the philosophical and scientific speculations of the Greeks. He may thus not inaptly be compared to a two-headed Janus, with one face turned to the light of departing day, and the other to the shadows of the coming night. In our Introduction will be found a statement showing the sources whence the text of this unique work has been derived. A biography of its author then follows; next, a synopsis of his cosmological views, and finally, citations of the opinions which have been passed upon his system of the world and the contents of his work generally. The translation here presented is literal, as far as the exigencies of idiom would permit. It is the first that has been made of the whole work into English, or, indeed, into any other language except Latin and Norwegian. In its preparation we have lacked the advantage, generally enjoyed by translators of classical texts, that of having at hand for reference a variety of translations and commentaries to throw light on passages that are dark, dubious, or disputed, or otherwise perplexed. We have had, indeed, the assistance of Montfaucon's Latin version, but no commentary whatever to give us light where we found Cosmas dark. That good and learned Father is generally accurate, but, like the good Homer, he sometimes nods, and we give at the end of the book a list of notes which refer to passages whereof his interpretations differ from our own. Another list of notes follows, in which suggestions are offered for the correction of the Greek text. Cosmas had some skill in drawing, and seems to have taken as much delight in covering his MSS. with illustrative sketches as was taken, according to his showing, by the Israelites of old in covering the rocks of Mount Sinai with inscriptions when once they had been taught by Moses the art of writing. Montfaucon, having made a selection from these sketches, relegated them en masse to the end of his work. His copies of them, which are not always quite exact, have been reproduced for the present work, by photographic processes, in a way which leaves nothing to be desired, and will be found, with explanatory notes, in the Appendix. The passages of Scripture to which Cosmas refers are very numerous, and the words are cited at length both in the Greek text and in the Latin version. We have, however, given only the references, in cases where this could be done without inconvenience to the reader. In conclusion we have to express our obligations to Mr. J. Coles, Map-Curator of the Royal Geographical Society, and to Dr. James Burgess of Edinburgh, for their kindness in writing for us those mathematical notes to Book vi, in which they show how egregiously Cosmas erred in his calculations of the size of the sun; while to Mr. C. Robertson of Edinburgh, late of the Indian Civil Service, we stand greatly indebted for valuable suggestions and criticisms made while he had the goodness to hear us read over our translation to him. Mr. Foster, the Secretary of the Society, must permit us further to say how much the work has profited by his careful correction of the final proofs, and the suggestions which he was kind enough on occasion to offer. FIRST of all I exhort those who will read this book to peruse it with all attention and diligence, and not to run over it in a perfunctory manner, but with loving pains to study it and take into their minds impressions of the places, figures, and histories which it contains; and when the book has been read to the end, let them further look into the volume which we have composed for that lover of Christ, Constantinus: a volume wherein we have described more fully the whole earth, both the one beyond the ocean, and this one, and all its countries, together with the southern parts from Alexandria to the Southern Ocean, namely, the river Nile and the countries adjacent, and all the races of Egypt and Ethiopia; the Arabian Gulf besides, with the countries adjoining and their inhabitants as far as the same ocean, and likewise the middle country between the river and the gulf, with the cities, districts and tribes therein contained----a volume 2 to prove that what things are said by us are true, and those false which are said by our adversaries, for whose sake this book and the drawings 3 it contains have been prepared----those, I mean, concerning the size of the sun, and that sun-burnt, uninhabited part of the world about which they din our ears, and vomit out fictions and fables. Let me next exhort my readers to examine the sketch 4 of the universe and the stellar motions which we have prepared as a representation of the organic sphere of the pagans 5, and to study the account of it sent to the pious deacon Homologus, then they with God's help are quite competent, especially with this book and the volume mentioned, to overthrow from the foundation the error of the pagan 6 theories. For if any Christian possesses these three works, and is by divine grace carefully exercised in the divine scriptures, he will easily confute the foolish views of the fable-mongers, for, from the figure itself, the constitution of the world and the very nature of things, they prove that the divine scriptures and the doctrines preached by Christians are perfectly true. Be strong then, ye Christians, in the Lord. Prologue II. 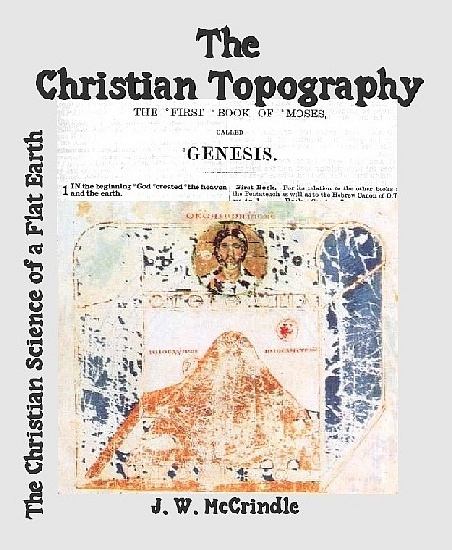 The Christian Topography of the whole world demonstrated from divine scripture, about which Christians ought not to doubt. IN days long gone by I hesitated, O God-beloved, God-loving and Christ-loving Pamphilus, to take in hand the treatise descriptive of the constitution of the whole world which you enjoined me to draw up. For even had I so wished, it was out of my power, as you well know, on account of the lingering illness by which I was prostrated. But since, in answer to your frequent prayers, I have recovered from that illness, accept at last the Preface to the books of the work which I submit, partly as fulfilling the obedience I owe you, and partly as dreading the condemnation of the sluggish servant which the discourse of our Saviour in the Gospels has pronounced. And let no one condemn me as overbold, because I conduct the exposition of my subject in a style homely and unmethodical, since it is not fine phrases the Christian requires but right notions. For while many be the darts and helmets and shields and wars set in motion against the Church, some supposed to be Christians, holding divine scripture of no account but despising and looking down upon it, assume like the Pagan philosophers, that the form of the heavens is spherical, being led into this error by the solar and lunar eclipses.8 We have therefore conveniently divided the subject of the book into five parts. In the outset then the first part is directed against the persons referred to who have been misled, and argues that one who wishes to profess Christianity cannot be led away by the plausible errors of those outside the Church----errors which are opposed to divine scripture. For should any one choose to examine closely the Pagan theories he will find them to be entirely fictitious, fabulous sophistries, and to be utterly impossible. Then again, for the Christian who will naturally ask and say: these being refuted, what are the true theories that must be admitted in opposition to them? 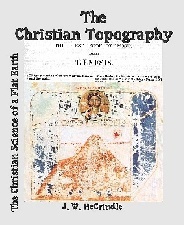 I have written the second book, which proceeds to explain from divine scripture the nature of the Christian theories----to describe the figure of the whole world, and to notice that some of the ancient Pagans have been of the same opinion. Then again, by way of replying to one who should doubt and ask: how does it appear that Moses and the prophets in saying such things say what is true? the third book exhibits the credibility of Moses and the Prophets, showing that they spake not of themselves, but as inspired by divine revelation, and that the writers alike of the Old and New Testament, men approved both by word and deed, having foreseen these things, declared them accordingly. It further shows what is the utility of delineations of the world, and how the notion of the sphere had its origin and beginning. The fourth book, again, has been written for behoof of those who wish to run their eye over the figures, and is a brief recapitulation, along with delineations, of what has been said before----a refutation, in fact, of the theory of the sphere and of the Antipodes. Then again, the fifth book has been written for those enquiring what the Christian theories are, and it shows that in what we have said and have represented by drawings we have neither devised fictions of our own nor invented new fables; but from revelation and from what God who created the world has ordained, have beheld the pattern of the whole world----namely the Tabernacle prepared by Moses, which the New Testament consistently with this view has pronounced to be an image of the whole world; and which also by means of the vail Moses divided, and so made one tabernacle into two, just as God also in the beginning divided what was one region, extending from the earth to the highest heaven, into two regions, by means of the firmament; and just as in the tabernacle there was an outer and an inner place, so here there was a lower and an upper. Now the lower is this world, and the upper is the world to come, into which also the Lord Christ, after having risen according to the flesh from the dead, ascended the first of all, and into which the righteous shall in their turn afterwards ascend. And since from Adam to Moses, and from Moses to John, and from John all the Apostles and Evangelists, have each and all in harmony, and both by words and types spoken of these two states; and since not one of them has uttered a discordant note, either saying that there was a state before the first, or supposing that there is a third after the second; but all of them, as if inspired by the Holy Ghost, have proclaimed that there are but two states only, we, therefore, putting our confidence in the scriptures, which are truly divine, have not only sketched the figures of the whole world, but also of those very places by which you will find the Israelites made their exodus, also the mountain on which they received the law in writing, and were instructed in the knowledge of writing; also the delineation of the Tabernacle and the settlement in the Land of Promise; until he who was expected to arise from among them, and who was predicted by all the men of old and by the Prophets, did actually appear, proclaiming the future second state, which on his coming he showed in himself to us all, having entered into the inner Tabernacle, into the upper celestial region, into which at his second coming he shall call the righteous, saying: Come, ye blessed of my Father, inherit the Kingdom prepared for you from the foundation of the world. To Him be glory for ever, Amen!